Countryside and coastline combine to make Bigbury-on-Sea and the surrounding region a designated Area of Outstanding Natural Beauty. This region is known as South Hams – the latter being an old English word meaning ‘sheltered place’. Inland you will find villages with thatched cottages and old-fashioned pubs nestling in breathtakingly beautiful countryside. The rolling hills create an idyllic landscape, with rivers meandering their haphazard way through the valleys. Meanwhile, in the higher reaches you will experience the drama of a rugged, exposed moorland. Down by the sea there are safe, sandy beaches, with hidden coves waiting to be explored by the more adventurous visitor. And wherever you go there are wonderful walks to enjoy, not only for the gentle exercise but also for the glorious Devon views. A diverse range of wildlife and flora can also be found throughout the area. Bigbury-on-Sea is perhaps one of the most unspoilt coastal regions of the South West of England; it is the perfect holiday destinatio n. Bigbury-On-Sea’s safe, sandy beaches are patrolled by RNLI lifeguards throughout the summer, making them well suited for family bathing. The village sits across Devon’s coastal footpath, the South West Coast Path. 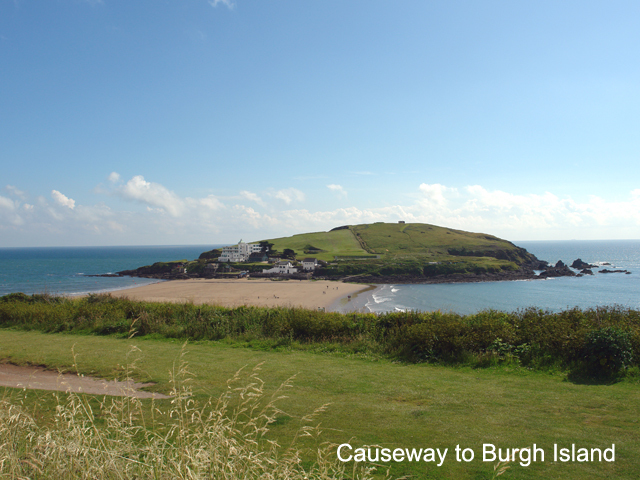 The South West Coast Path links Bigbury to Challaborough Bay and Arymer Cove to the west, and the Avon valley to the east. 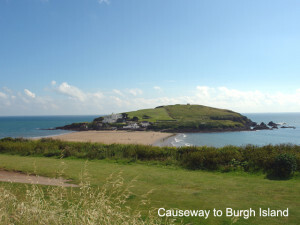 Bantham Beach lies to the east beyond the Avon valley. The beach can be reached at low tide by wading across where the river meets the sea; in summer, there is a pedestrian ferry. There is also road access to Bantham, crossing the river at Aveton Gifford. There is plenty of fun Activities and things to do in the area. There are also places to visit from National Trust Properties to Local Towns and interesting tourist attractions which cater for a wide range of interests. The nearest local shops are either at St Ann’s Chapel which has it’s own small Post Office & local store with a range of provisions available or at Challaborough. The picturesque towns nearby also afford many opportunities for browsing… Modbury is the closest but there is also easy access to Kingsbridge & Salcombe, Dartmouth, & Totnes. Plymouth is only 20 miles away and gives access to all the usual modern High Street stores. The main shopping precinct is Drake Circus. Farmers and other markets are held regularly in most of the local towns.